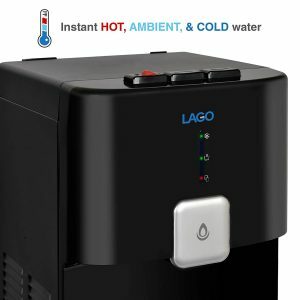 Black Lago CLBL220 is a 2017 model bottom loading water cooler with a state of the art technology, that dispenses cold, hot and room temperature water whenever you want. It is one of the best selling hot new release models on Amazon.com and seems to be getting quite positive reviews by the customers. It is suitable for both homes, offices or waiting rooms and you can use it with the three gallon and five-gallon water bottles. The advantage of a bottom loading unit is you do not have to lift any heavy water bottles when you need to change or replace them or make a mess by spilling on the floor. It is quite easy to install the bottle in three easy steps and there will be no awkward maneuvering or strenuous lifting. Cold water is pretty cold at between 40 and 44 degrees Fahrenheit and will be good for preparing cold beverages on hot days. Hot water is piping hot and more than enough for making instant soup, porridge, tea coffee or hot chocolate. Or you can choose to have the ambient temperature water. There is a single tri-temp push button for you to select one of the three- hot, cold or room temp easily through the faucet. There are there LED light indicators just under the LAGO logo: The top green for “Cold Water Ready”, middle green for “Hot Water Ready” and the bottom red for “Bottle Refill”. These LED lights are also good for dispensing water easily in dim light or the dark. So you know when you need to replace the bottle or when the cold and hot water is ready. At the rear of the cooler dispenser, you’ll see the hot water and cold water on and off buttons (green for cold and red for hot), water tanks, hot water drain, radiator, compressor, diaphragm pump and the power cord. It comes with the integrated Child Safety Function that prevents kids having access to hot water and you can turn off the hot water through the button at the back, and you can have a peace of mind. There is an easy-to-remove drip tray that is safe to be put in the dishwasher and cleaned easily. Thanks to the separate food-grade stainless steel hot and cold water tanks you will enjoy pure, clean and tasty hot and cold water whenever you need. Lago CLBL Water Cooler has a beautiful modern design and looks nice and contemporary in black, weighs 30 pounds and measures 44 x 15 x 15 inches. It is easy to use, has a convenient bottom loading design, works well consistently, dispenses hotter hot and colder cold water than similar other models and is not really expensive. It is also great that the ugly water bottle will be hidden in the bottom section. 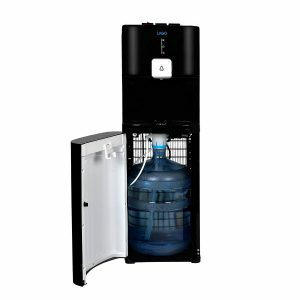 Lago CLBL220 is a UL listed and Energy Star approved water cooler, that is also approved by NSF under ANSI 372.